It is New York week on PST and that is just fine with me. I love New York. From the tender age of four I was known to proclaim my intention of going to “the Broadway” (the exact definition of which remained shrouded in mystery to me and my friends for a long time), when I was old enough to start my career as a musical star. Every ballet class from then on was transferred to the big city in my mind; I imagined accepting a Tony award on a regular basis, my speech and tearful smile being honed to perfection through dogged daily repetition. My poor mother and my childhood friends became so used to my constant prattling about New York, about my American dream, it barely registered anymore. I was so determined, I clearly remember saying in Kindergarten that I would move to New York soon and the unsuspecting teacher believed our family would really move and asked my mother about it. I was forbidden to talk about it in public from then on. I did as I was told, but I never stopped dreaming. Sadly reality interfered. I turned out not to be musical star material, and accordingly my dreams changed, but New York remained an integral part of every future I envisioned. I wanted to attend university in NY, after that did not materialize either, I consoled myself with the thought of looking for a job there later. One day I am going to go to New York to live, you just watch me! When I first set foot into New York City, I was driving a car coming from Boston. My delight of the ease of finding my way around, because of the practical grid system of the streets was diminished by the many, many, many cars honking and hooting their way through the crowded intersections and the hordes of seemingly traffic-unaware pedestrians streaming through the streets. A hysterical breakdown only closely averted, we (a friend and I) arrived at the Pennsylvania Hotel in Midtown and gladly handed the key with a shaking hand to the valet, who stowed our car on some roof far, far away. New York is best discovered on foot. I immediately saw with great delight the close proximity of our hotel to Macy’s on 34th. So this was my first point of call, because I’ll have you know, even then, twenty years old, I was keen to get my nose near a bottle of perfume as fast as I could. And Macy’s did not disappoint. I remember clearly the first perfume I ever smelled on American soil – Burberry for Women, it was 1995, what can I say. 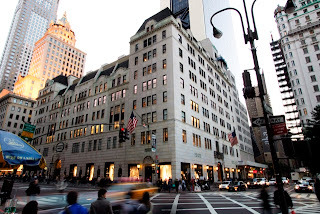 The next day we went for the big guns - museums, parks, sights, they all had to wait - I wanted to go to Bergdorf Goodman. 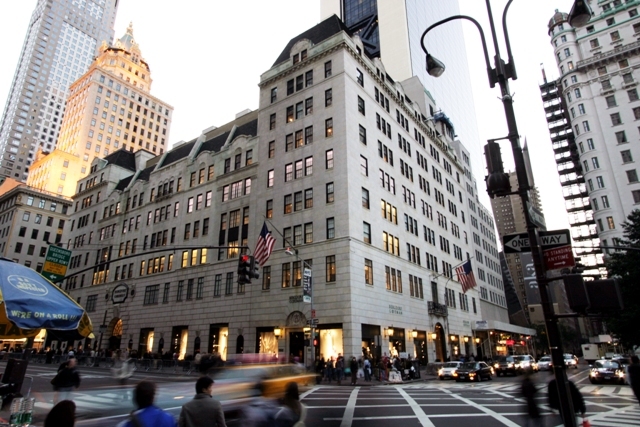 Who needs the Empire state building when there is the beauty department of Bergdorf’s? Exactly. To cut short what could fill a book: I loved it. I was overwhelmed, but in a good way. The luxury, the beautiful people, the never-ending variety of exotic and unknown brands and lines and products, so foreign and so much better than what I was used to. The sales assistants were intimidating and I felt like a little girl playing dress up and afraid of being discovered in the world of the grown ups. My first destination was the Chanel counter. And I knew what I wanted from the get go. After timidly sniffing my around a little I bought what I came for: a bottle of Chanel N° 5. Not because I really thought it smelled good, it was way too harsh and “perfume-y” for me then, but because I perceived it to be my ticket into the world of adult sophistication, of elegance and maturity, of attractiveness and womanhood. New York City smells like Chanel N°5 for this girl. Fifteen years later I have grown into N° 5, I have learned to appreciate and love it for its scent not only for all its ramifications and attached images. But I also love it for the memories of my first trip to the city of my dreams, the epitome of what I thought America was (totally not the case as I discovered later), the essence of my dreams of what I would like to be. Life seldom turns out the way we imagine it as children. It takes turns, some good, some bad, all surprising. The trick is arranging yourself with what you get and never to stop striving for the things that lie in the realm of the possible. Until then there is always Chanel N°5. You were brave to drive a car into NYC to first time you went there! I remember the first time I went there I said I will never drive a car here. And the first place I wanted to go was Tiffany's. I wasn't into perfume then. Wow, you've been dreaming of living in New York from the age of four? In that case I have no doubt you'll do it onw day. I can see why you associated it with No.5, they both project sparkle and sophistication. Lovely post. NYC will always be L'Artisan's L'eau du Navigateur for me. I was at Tiffany's too on that first day. oh, I hope I will do it some day, it won't be for lack of want if I will not. Sparkle and sophistication expresses both scent and city perfectly, thank you! New York has such a pull, hasn't it? Enjoyed reading your post, as always. I have yet to visit NYC or Boston. They are one and two on my list of travel destinations, though. Chanel #5 is one of my favorite "feminines" along with #19 and #22. Boston is a beautiful city too, it has a very European feel in my opinion. I hope you get to travel there soon. For me New York City smells of Bond No.9's "Briant Park". I don't really have any scent memories of NYC; the last few times I was there, it was such a nightmare (bickering adventure mates), that I think I need to wipe the slate clean and start again. I second Marsha's comment: what a brave 20-year-old girl you were driving a car in New York City. And how cool that you kept at least part of your dream alive by visiting there at a young age. I visited almost every year since, I married another New York-aholic, but I never actually made the leap. I'm still waiting to get to New York - so I especially loved reading this! I always forget that for most Americans New York is just as far away as for Europeans.